I have to admit, the basis for the dough was borrowed from a couple of other online recipes, and my tweaks to the method and a new filling applied. Although this is only my first attempt, I would have to say that my filling was great, but even though the final result was amazing, the dough mixture was just too dry (just look how little liquid there is in it!) – this made it difficult to knead and severely retarded the rising, in turn making it hard to roll out to a good size, and warranting an extended proving. 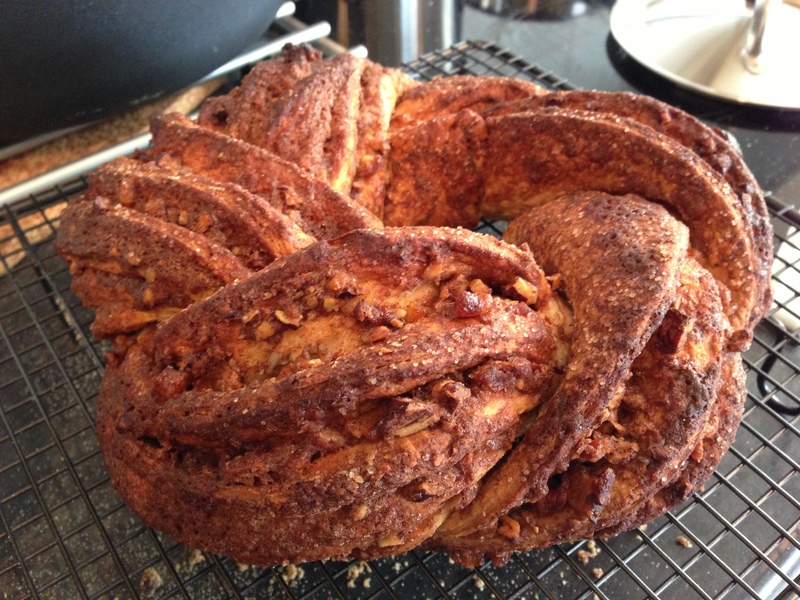 I think I can make this even better using a softer dough – Next time I’d look to use the enriched dough I use for my Danish Pastries, so all my own work! Set aside somewhere warm, covered on a baking tray, for about an hour to prove. Reheat the remaining cinnamon butter and using a pastry brush, carefully rub over the surface of the proven dough. This will give the outside a great crunch! Cool on a wire rack before eating. Beware – it goes quickly, especially on Mother’s day! This looks so good! I think the twisting part might need some serious practice though… Thanks for sharing – this is really unusual. Oh Louise – it’s really easy and looks so impressive. Give it a try!